At five months old, your baby may be sleeping soundly through the night… or maybe not (grrrr). Some mums find the fifth month a turning point where they finally feel a little more “in control” of their baby’s routine. A five month old baby is often past that 4 month old sleep regression stage but, teething could be messing with your 5 month old routine. All babies are different, and all mums are tired! We’ve asked , Tara Mitchell, a baby sleep specialist, what mums can expect from a three month old baby. If you have any concerns about your baby’s sleep patterns, feeding or general health, speak to your doctor right away. We’ve also put it to our giant community of Aussie mums to weigh in with real world experiences of of the 5 month old baby routine. 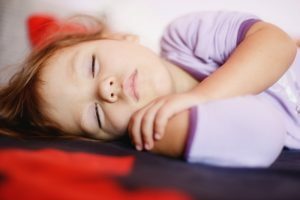 For some, the fifth month can be a really great time to see consistency in patterns and really feel as though you’re starting to understand your little one’s sleep needs and be able to read their tired signs much better. If you’re still stuck in the ‘four-month sleep regression’, I encourage you to begin to work on self-settling for your little one. For some this isn’t a path they want to go down – many parents choose to co-sleep or look at alternative solutions and that is 100% fine but if it’s not working for you or it’s not something you can see as a long term plan, then now is a great time to work on it. By 5 months I recommend that little ones have both arms free and are no longer in swaddles or Love To Dreams (unless it’s the sleeping bag with arms out). So if you haven’t made the move yet, remove one arm for a few days and then the second arm after that. You may find you have a few rough nights, but the longer your little one’s arms are in, the more they will begin to rely on that feeling for sleep. You may also notice your little one is beginning to roll (or trying to). Having their arms out is essential during this time for their safety. Their arms will play a role in being able to prop their head up when they move to their stomach. Can you add anything for mums of five month olds? Please help by being part of our community, and add your hints and tips below. My DS wakes around 7.30-8am.. Bottle play and play for an hour then sleeps for an hour. This goes on throughout the day. Drinks 120mls-180. Playtime can be bouncer play, tummy time as he’s just learnt to roll, tickle time or watching me clean or cook while he plays in his pram or bumbo. His stuck in this every 2 hr routine. But its what works for him atm. Around 6pm he will go down for a nap but wont wake till around 8.30 then its bath, bottle, cuddles and bed.